Each issue of Love Sewing is full of high-quality practical sewing projects. Be part of a close-knit community of makers who are discovering the joy of creating more for themselves. Buy a single copy or subscription to Love Sewing magazine. Featuring a free monthly pattern, easy-to-follow step-by-step guides and using the latest fabrics you will be able to create fabulous contemporary accessories for your home, family and wardrobe, with even basic sewing skills. Whether you’re a complete beginner or already an avid maker, every issue will inspire and build your skills from mastering your machine to perfecting your sewing technique. • FREE access to the VIP lounge – exclusive craft offers, projects, downloads and more! Never miss an issue of Love Sewing again! 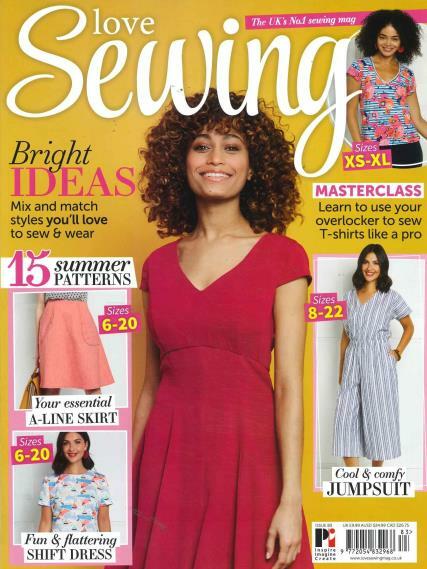 Buy a subscription to Love Sewing magazine for you or a friend today. Daughter loves this. Thank you very much!